Just as we employees look for our W2s at the end of January to start the exhilarating process of filing our annual taxes, so too must these businesses and producers get their taxes in order - and it all starts with an accurate 1099 . That's why it’s a daily occurrence from now through March: those last-minute 1099 questions from vendors and producers. 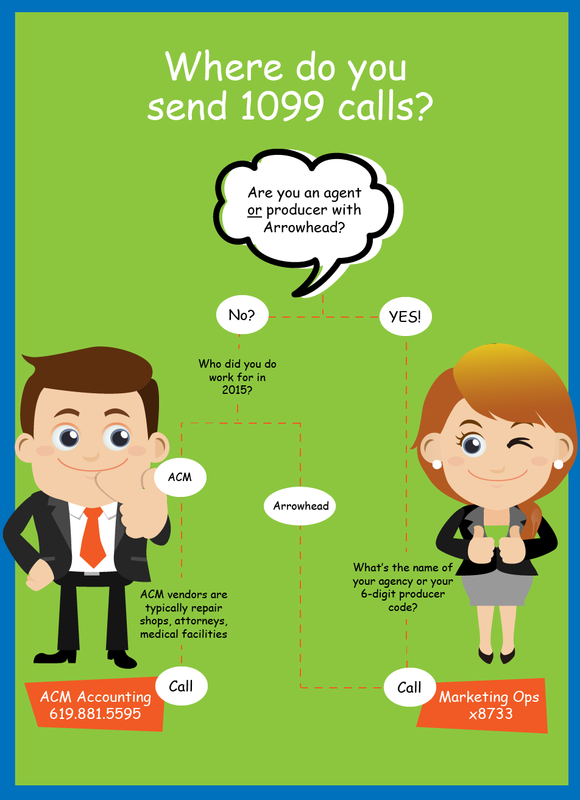 If you should get one of these calls, we’ve created a snappy little infographic to help you quickly and correctly route them to the right contact. So, what's a Form 1099 and who gets one? They're somewhat similar to an employee's W2, showing how much you were paid for the year. A 1099 also shows the amount paid to the producer or vendor. As a general rule, Form 1099s are issued to each person or company to whom we've paid at least $600 in services (including parts and materials), prizes and awards, or other income payments. What happens if we don’t send them out? The penalties can vary from $30 to $100 per form (or, gulp, up to $1.5 million for the year), depending on how long past the deadline the company issues the form. And if we intentionally disregard the requirement to provide a correct 1099, our company is subject to a minimum penalty of $250 per statement - with NO MAXIMUM. So now you see how important those forms are! And they’re even more important to our producers and vendors. You know how badly you hate doing your own taxes? Imagine if you received the equivalent of a W2 from 10 or so employers! That’s one heck of a tax filing headache – yet that’s what they face every year, trying to gather all that taxable income information together to determine their gross income, plus adding up all their deductibles to help them preserve as much of that income as possible. Makes you glad you're a W4 employee, doesn't it? When are the 1099s due? We are required to issue and mail out the Form 1099s to vendors by January 31. And don’t assume 1099 questions will stop by month-end. Many more questions may arise once contractors receive their 1099s.